For my card I have used one of the Elisabeth Bell Merry Christmas prints, isn’t he just a little cutie! I have used my favourite 2012 Christmas papers – Lily Bee Christmas Cheer Tiny Tablet. I have also used the Whimsy Snowflake Mini Letter Seal die and matching Snowflake Mini Letter Seals sentiments. The pearls, bells and lace are from Wild Orchid Crafts. Whimsy Prints Collection are very straight forward and easy to use. They can be attached directly to your project with glue or double sided tape. Use them as is or cut to fit the needs of your project. One of the benefits of using Whimsy Prints is to cut back on the amount of time needed to hand color images. To summarize, it is a great way to make quick projects when time is of the essence! These are also wonderful for beginner crafters and kid projects. If you joined us for our last 2 releases, you may have seen some of the beautiful projects our DT and Special Guests have created using these prints. Today we are showcasing these gorgeous Whimsy Prints with a special BLOG HOP! In addition to our regular Special Guests, we are delighted to welcome both Crissy Armstrong and Elisabeth Bell who are joining us for this hop! The hop starts today (Friday November 30th at 12.00PM EST) and ends on Monday December 3rd at 12.00PM EST. For this hop we have 4 different candy stops where you can enter to win a set of Whimsy Prints. The location of these candy stops is a secret, so if you haven't found them, please go back to the beginning and start hopping! If you would like to hop along with us today you need to start right here and continue on with the next stop being Debbie Eastman’s blog. I’ve still got me nose to the grindstone with magazine work so here’s one I did a few months ago for Making Cards magazine featuring Winter Fairy from Lili of the Valley and Nitwit Collections digi papers. The cards were specifically aimed at children so no flowers were to be used. Man! I struggled haha. The pearls are from Wild Orchid Crafts and the snowflake is a Marianne Design die. The frame around the fairy was made using Nestibilities. Another baby card today, this time using non-traditional baby colours for a change. The stamp is Bath Time from Lili of the Valley. The paper is from the Graphic 45 Little Darlings pad. Welcome to the Whimsy Stamps November 2012 rubber stamp and die release! Today, Whimsy Stamps is releasing 21 fantastic new Rubber Stamps & Stamp Sets, 5 wonderful new Whimsy Shapeology Dies, 2 fabulous new Shape EZ by TLC templates, 2 beautiful Whimsy Designer Paper 6x6 packs and 2 new Whimsy Prints Collection pre-coloured topper sets. These new goodies are available to buy right now from the Whimsy Stamps store along with all your Whimsy favourites. For today’s card I have used Skippydee and Bella, and also the new Snowflake mini seal die and matching Snowflake mini letter seals sentiments. Paper are from the Lily Bee Jingle Tiny Tablet pad. Flowers and satin ribbon are from Wild Orchid Crafts. Flowers used are 25mm hybrid tea rose, cherry blossoms and 15mm roses and I have popped in some white stamens in amongst the flowers. Sheesh, Monday already! I have had one heck of a busy weekend, I was down to LOTV for their open day on Saturday and then spent Saturday evening and yesterday working on magazine commissions (beats Christmas shopping any day lol). The Wild Orchid Challenge this time is A Child’s Christmas. My fellow teamies have come up with the most amazing ideas, I am so honoured to be able to work with them. My effort is rather quick and simple, and is Amy’s Christmas card. I have used another of the fab Whimsy Merry Christmas Prints, already coloured and ready to pop onto a card. The Wild Orchid Crafts products used are metal corner, 40mm wild rose, cherry blossoms, sweetheart blossoms, 15mm roses, seam binding and little bells. For my card today I have used Honeybee & Buzz (OMW isn’t she just the prettiest little lady!!). 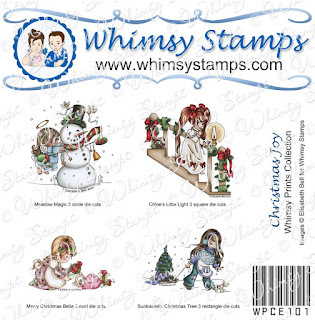 The sentiment stamps are also from this new release – New Winter Postage Stamps. These are just FAB! And I made the poinsettia using a Spellbinders die and pearlescent parchment paper. I edged the petals with Walnut Stain then Platinum Stickles and popped a Flat Back Pearl in the centre of a metal bead cap. The other flowers used are 20mm roses and 15mm roses as well as stamens and are all from Wild Orchid Crafts. The paper is Pion Design Silent Night and the gorgeous Sparkle Edge Gold Trim (under the seam binding) is from Dies to Die For. It’s scrummy! ** Guest Designer Contest - January 2013 ** Would you like to join us as our guest designer for our January 2013 release? 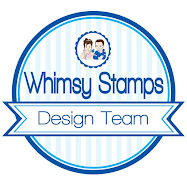 If you would like to be considered for this, please make a new post on your blog telling us why you would like to be a guest designer for Whimsy Stamps and add the direct link to your post in the Linky tool on the Guest Designer Contest page HERE. 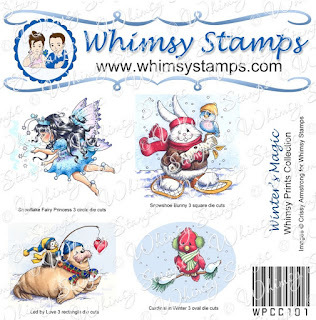 Please ensure you include at least one Whimsy Stamps creation in your blog post (this doesn't have to be new, but it would be great if it was a recent creation). The contest will remain open during the entire November release week and will close at 12.00pm EST on Wednesday 28 November. The winning entry will be announced in the "Release in Review" post on the Whimsy blog on Wednesday 5 December. For a full reveal of this month’s fabulous release, please visit the Whimsy blog. Thanks so much for stopping by and I hope you enjoy our new release! A quick post this morning as I have another card to post later this afternoon for the new Whimsy release. Here’s a couple of candles made for my grandchildren's teachers (with the kiddo’s help …. that was fun!) using two of the sweetest little angels from Lili of the Valley and finished off with some 15mm roses and satin ribbon from Wild Orchid Crafts. We even managed to get the wings glittered before embedding the tissue paper into the candles. Our Lou has done the most amazing sketch for this week’s Saturated Canary challenge, I really love working to a sketch and never seem to get the time to do so, so had fun making this card. I have used the Lily Bee Jingle Tiny Tablet papers for the card, they are gorge!! The digi is Stockings from Saturated Canary and has been coloured with the usual Copic and Pencil suspects. I made another of those burlap poinsettias using the Spellbinders Poinsettia dies, and used a snowflake charm as the spacer for the brad to hold the flower together, and suspended a little stocking charm from the back of the brad. I edged the flower petals with distress ink and stickles. And that’s it from me today. Apart from to say I have listed a few as yet unseen cards in my Etsy Shop. The paper is First Edition (but not sure which pad I used), the flowers lace and seam binding are from Wild Orchid Crafts. I have used copics and pencils to colour the image. The stamps will be available to buy on the Lili of the Valley website from midday on Sunday the 25th November (UK time) and you will also be able to get them at the Lili of the Valley Christmas party at their showroom in Leeds on Saturday (24th) if you are able to make it. The Design Team are all taking part, you just need to ‘hop’ from one blog to another following the links and leave a comment on each card. We’ve used all the stamps between us so hopefully we can give you lots of ideas and inspiration. There are mystery prizes along the way so make sure you visit every blog. We will let you know tomorrow evening which were the ‘lucky’ blogs and 2 winners will be drawn at random from all the comments that were left. 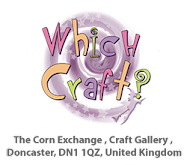 There will be 2 prize winners, each winning the 2 sets of clear stamps and 6 rubber stamps of their choice from the new designs (each prize value £52.00)!! Hi peeps, I’m back with another Lili of the Valley sneak peek. Don’t forget these go on sale in the shop on Saturday 24th (and if you’re in the area I will be there on Saturday taking a Distress Inks workshop and also demonstrating before the workshop). The stamps go on sale on the website on Sunday 25th. today’s card features Starry Bunny and also the sentiment from the Companion Set. The papers are Nitwit Collections (Great Expectations I think). The lace, satin ribbon and flowers are all from Wild Orchid Crafts. We are celebrating a new Saturated Canary rubber stamp release today and you can get the entire collection at Little Darlings Rubber Stamps, and many of your favourite craft stores around the globe. We have the most fabulous Blog Hop today to offer up oodles of inspiration. The LDRS DT and SC DT have joined creative forces to give you an outstanding display of their artistic abilities. For my card today I have used Rebecca, isn’t she just gorgeous! Flowers from Wild Orchid Crafts – Hellebore, fabric daisies, 25mm rose, tulips, 15mm roses, 8mm semi open roses, stamens,Flat Backed Scalloped Pearls and seam binding. The gorgeous Large natural circles trim lace is from Dies to Die For as are the Whimsy Holiday Mini Tickets sentiment stamps. The die cut clock is by Marianne Design. I have a super quick card today, using one of the Whimsy Stamps Christmas Prints, perfect for when you are in a hurry as the colouring has been done for you. I teamed it with the newest Nitwit Collections digi kit – Patchwork Christmas. This kit is just delish! Love the aqua and cranberry colour together, soooo pretty! The sentiment is from the Holiday Notables 2 set. This week’s candy winner is ………. It’s Christmas for this month’s Dies to Die For challenge and I have gone for something a little different. I so need to make lots of quick cards for Christmas and this is one of those. 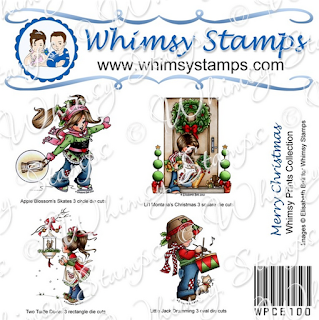 The sentiment stamp is from the Whimsy Stamps fabulous Tis the Season Notables 5. The paper is Bildmalarna Blue Christmas and Mr Snowman. The 1/2” natural lace was stapled in place and finished off with a bow. The card was finished off with flowers from Wild Orchid Crafts – 25mm wild rose, cherry blossoms, 15mm roses and 10mm roses. Priced at £1.20 for a bunch of 10 they are a total STEAL so if you want them go fill ya boots now, I think they are going to fly. Just been and ordered mine hee hee. I love a bargain!